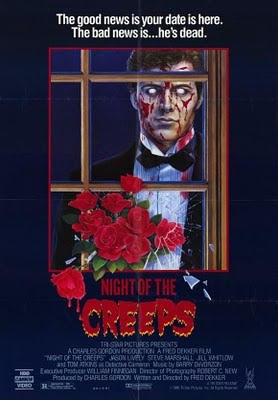 The Rockport Film Review: "Night of the Creeps" - '80s Horror Classic! This movie is a gem of the 1980’s horror/comedy genre. It was just released on DVD for the first time this October. Directed by Fred Dekker, this landmark movie has inspired many other horror films like 2006’s “Slither” by Sean Gunn. It’s a great party film or so I’ve heard. I don’t get out much or I could confirm this theory. The opening scene shows midgets in rubber suits (Aliens) on a spaceship that is being invaded. Is that a great way to open a movie or what! They jettison a container of something into to space and it finds its way to Earth. We then come upon a scene set in the 1950s that is shot in black and white. There is a teenage couple making out at a lovers lane cliff overlooking the city when they see a “UFO” crash into a field. They go to examine the crash as the radio blares about an escaped mental patient. They pull over on a vacant stretch of road and the guy goes into the woods to investigate. We see the escaped psychopath approaching the car, and he eventually hacks up the girl with an ax. Upon inspection of the UFO, the guy has an alien slug fly into his mouth, infecting him. This is where the movie goes back to color and we see Detective Landis disturbed from his nap by the phone ringing. Landis is your typical hardboiled cop who found those bodies’ years back. He has the memorable catchphrase of “thrill me!” every time he answers the phone. Our main characters are two college freshmen. Chris is played by Jason Lively who got the part right after playing Rusty in the classic European Vacation. He is your basic everyman that you can really get behind and root for in a horror movie. Then we have his best friend J.C. played by Steve Marshall. He’s a witty, smart-assed handicapped kid who everybody likes. Except of course those mean frat guys. The head frat guy is played for a laugh since he is such a clichéd stereotype. He is a blonde haired, sweater vest wearing guy named Brad. His red sports car even has license plates that say “Bradster”. What a douche! Anyway, Chris has a huge crush on a sorority girl, Cynthia, but she is also the Bradster girlfriend. Chris and J.C. try to get into a fraternity and must somehow get a dead body and put it another frat houses yard as a pledge. In the college medical research building, they find a cryo-chamber with the frozen body of the infected guy from the ’50s. Needless to say, he is thawed and escapes to infect the campus. Upon investigating the lab Detective Landis asks the cops “Is this a homicide or a bad B-movie.” Director Fred Dekker also wrote the script and has several tongue-in-cheek scenes and bits of dialogue. Kind of like what the Scream movies did in the mid-’90s. The alien slugs go in through your mouth and lay eggs in the unfortunate person’s brain, turning them into zombies. Their heads eventually (whether shot or hit with an ax) explode, releasing more slugs to infect more people. Cynthia finally leaves Brad after he trips J.C. in front of a crowd. Dude, picking on the crippled kids will not win you points with the ladies. Chris finally gathers enough courage to talk to her and she asks him to be her date for the dance. On the night of the big formal, the frat guys run into a little bad luck, and Detective Landis (who has all the best lines) says “The good news is your dates are here, the bad news is their dead.” The whole sorority house scene that follows is completely insane and fun to watch.